After reading What's Mummy Up To? Bunny Bags post on the weekend I was inspired to write a tutorial for Easter Baskets. I have used left over jelly roll strips from some recent baby quilts to make the basket, and the offcuts from the quilts to make the handles. The basket size could be varied to suit your fabric or needs & you could always use a single piece of fabric instead. I gathered my stash of orphan jelly roll strips to audition & searched my scrap basket for the off cuts of pieced strips from recent baby quilts for the handle. I chose to use 8 strips for my baskets meaning I would have a circle circumference of 16". For the handle, I used some joined offcuts that had 6 pieces (finished handle length 12") & trimmed them down to 2 1/2" wide. To calculate the size of circle needed for the base, I chose to google 'calculating diameter from circumference' rather than use my rusty high school maths skills. A 16" circumference gives a diameter (measurement across centre of circle) of 5.092958178940651". Don't panic!!!!!! rounding up gives us 5.1". 5 1/4" is 5.25" so I knew I had to cut a circle a smidge (technical term here) smaller than 5 1/4". You can trace a circle from a dish that is that size, or rather than search for the exact sized dish, I used the circle on my revolving cutting mat & worked with the measurements on the grid to draw mine the right size. Fabric for outer basket, including base & handle, fabric for lining, iron on pellon & thread. Cut out lining & pellon to match size of basket. Cut out 2 circles from lining fabric & 1 pellon circle for base. Cut out 1 handle (I trimmed pre-joined strips or cut chosen fabric to 12 1/2" long & 2 1/2" wide), 1 handle lining & 1 piece of pellon for handle. Press pellon to back of basket piece, base circle & handle. 2. Sew handle lining to handle (down long sides only) & turn through, then press. 3. Quilt in desired pattern the basket piece, handle & base circle. 4. Join short sides of basket piece together with 1/4" seam. Mark the quilted basket sides & quilted base into quarters with pins, then pin together using markers as guide. 5. Stitch quilted side & base together with 1/4" seam. Take your time with this step, there is some give in the fabric & you can "smush" (another technical term here) the pieces together to fit, working carefully around the circle quarter by quarter. 6. Place the handle inside the joined basket, with right sides facing. 8. Mark into quarters with pins, pin together then join lining piece to lining base circle. 9. Place lining inside the basket, rides sides facing (I placed the joined side seams on opposite sides of the circle). Pin lining & basket together, ensuring handle is pinned as well. 10. Stitch around top of basket with 1/4" seam. 12. Give a light press around this top edge to ensure lining sits well inside the basket. Top stitch around the top of basket (stitch from lining side). 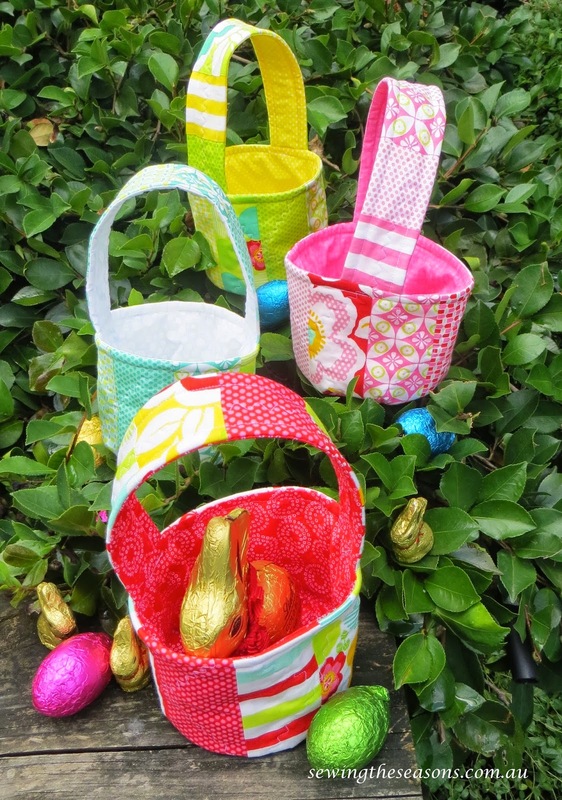 Your Easter basket is now finished, ready for the Easter Egg hunt. After Easter, the basket could be used to store hair ribbons or special treasures. 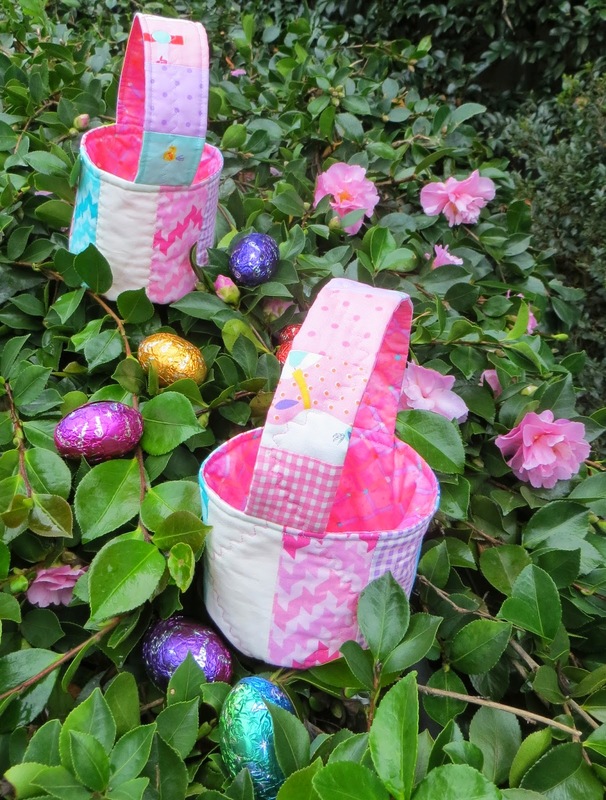 You can check out my extra tutorial here where I have used one pack of charm squares to make 7 colourful Easter Baskets.